Yep, you read the title right. I'm 40 weeks pregnant. :) Baby T is definitely overdue! Still trying to keep as active as possible and making sure that I get out and about every day, as I know walking is beneficial. Wore this simple jeans and tee outfit to go to the doctors on Wednesday. Added the scarf to keep me warm as it was a little chilly. Not the best photo of it, but it's a lovely blue skull scarf. I couldn't resist buying another skull scarf to add to my collection when Matches Fashion sent me a discount code! I really like the way they styled it on their site with the white tee and pale denim. Unfortunately I don't have any plain white tops that fit the baby bump, so went with this striped one instead. I liked the result, although I look forward to trying it with a white tee later! 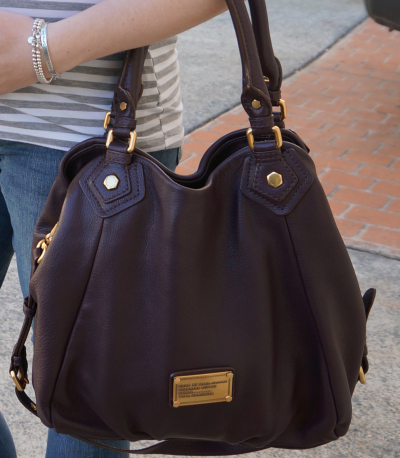 Last worn: stripe tee, maternity skinny jeans, Havaianas, Marc by Marc Jacobs Fran bag. First time I've worn the scarf as it's a recent purchase. Today was spent on the phone mostly! Lots of people calling and texting to see how things were going and if there are any signs of baby's arrival. I'm really feeling loved, with everyone checking in hoping all is still well, asking how I am and giving us encouragement. 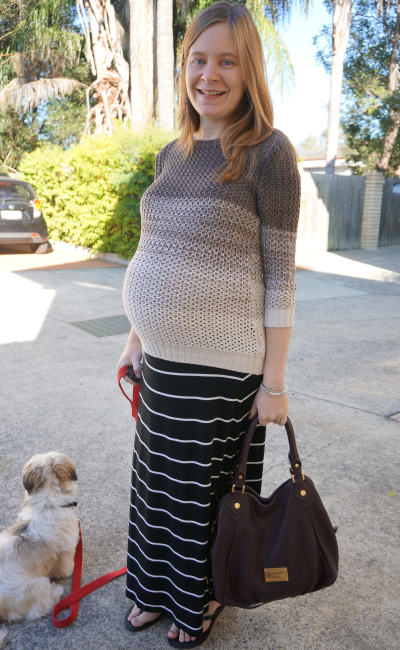 Comfy knit and maxi skirt outfit today as I had another acupuncture appointment this afternoon. Loose layers are good to wear when getting poked with needles. And I'm pleased this stretchy knit still fits the bump. Looks very different from the last time I wore it! Thought that the ombre effect looked nice with the stripes, what do you think? Last worn: Jeanswest ombre knit, striped maxi skirt, Havaianas (see above), Marc by Marc Jacobs Fran (see above). 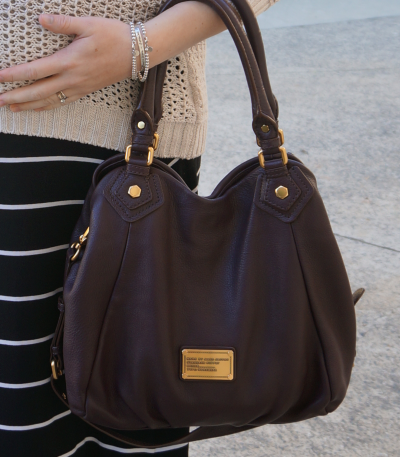 Linking up with Spotlight Weekly, Tres-Chic Fashion Thursday, Summer Style, Three-fer Thursday, Fashion Item Friday, Casual Friday today. As soon as you stop blogging I will know what is going on haha ;) I really like such looks, too. Simple white tees are so versatile. And I like your black havaianas! 40 weeks!!!!!! Bubba will be here soon, I promise! I hope you know how fabulous you are looking! Oh my goodness! How exciting to know it's so close! you must be getting so impatient!! still looking wonderful. can't wait to find out whether it's a boy or a girl! love your new scarf, btw. the light blue looks lovely with white & gray stripes. 40 weeks! Excited for you. You look great! Oh my goodness, any minute now! (Time really flies, but more importantly babies!) Plus, how do you manage to look so cute?! I love the gray top + blue scarf combo! wow, congrats on making it 40 weeks! i can't believe baby T will be here any day now! you look amazing and good thing you're keeping active! So excited for you Mica, 40 weeks…. its only a matter of days now until she arrives. I can only wish for you the best ! Hugs. You look super cute and I'm so excited for you!!! My goodness, any day now! So exciting, and I love that ombre sweater on you! So pretty! Such great outfits - and that bag! 40 weeks wow!! Time really flies! you look amazing - I realllly like how you look with that sweater! Very pretty! Wow...you must be just ready to go. Are you on maternity now? I don't know why I did it but I worked till the day I gave birth. Looking so radiant in your last days of your pregnancy! 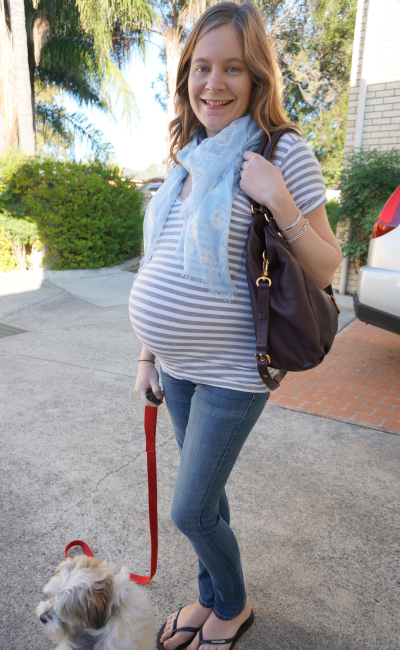 Never underestimate the stretchy elastic of maternity jeans, haha! The waiting was all part of the fun, so glad to have baby in our arms now! Wao 40 weeks!!! I'm so excited for you, I bet the baby should be coming any day now!! Looking cute as always!! You look beyond beautiful! I adore the second look, Im loving that sweater with the maxi skirt. Mica, I know you will be glad when you're baby gets here! LOL Well girl you're the best 40 week pregnant lady I have ever seen. You're all stomach and that's it. Great outfits doll. The time will be here before you know it. Can't wait till baby is here! so excited for you, your baby will be here so soon! i love both outfits, the sweater is super cute on you, and i absolutely love that alexander mcqueen scarf! So close! and you look terrific!!! love the last outfit!!! so chic! Stunningly stylish! The child will have a very beautiful mother! Congratulations Mica, I wish you all the best! Thank you all for your kind comments! Baby T arrived not long after this post! !